This small building tucked in a wooded setting was erected in 2002. It is designed to represent the utilities that a large estate or small community would have used in the early 1900s. Represented is electric generation, water pumping, air compressing, a small light plant for the building, and telephone service. Electricity is delivered by the knob and tube wiring system using period light bulbs. Browse the next two pages for the equipment inside. 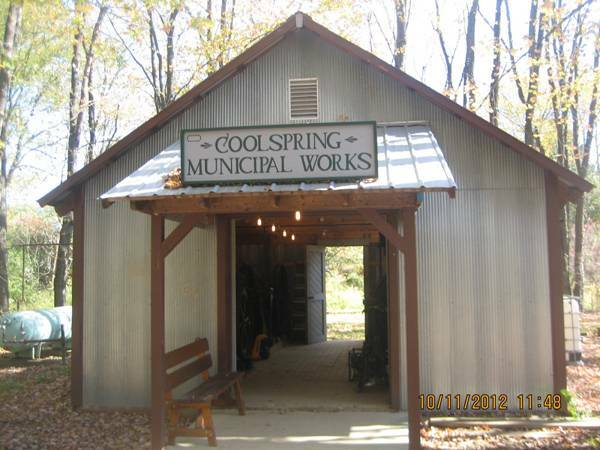 The Coolspring Municipal Works exhibit at the museum.